The modern era has witnessed drastic changes in the electronics industry. The demand for electronics products is rising and different companies are emerging to woo the customers. In such a scenario, Hitone Electronics saw its inception in the year 1979 in Delhi, the national capital of India. Since then, the company has been operating with a commitment to produce quality products in the Public Address Systems and Sound Communication Systems industry. 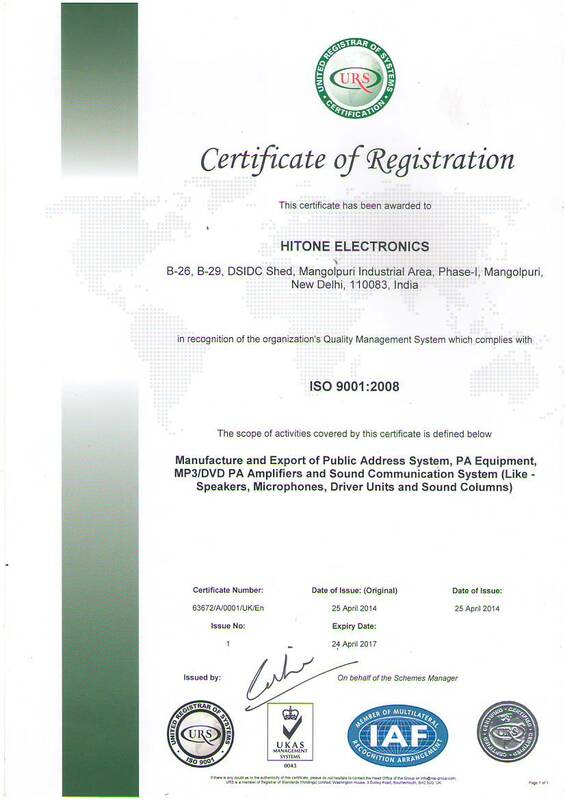 Today, Hitone Electronics is an ISO: 9001:2000 Certified company. It has been successfully maintaining international standards in all of its processes. The company has efficiently established the brand name for its products -- HITONE BOSS in the market that stands for reliability and performance. The growing popularity of the brand in the national and international market stands testimony to this fact. Hitone Electronics boasts of its ultramodern manufacturing facilities. The company has equipped itself with state-of-the-art machinery to offer the best products to its customers. It has established a vast network of distributors and dealers to reach the customers in each and every corner of the country. At present, Hitone Electronics has more than 100 dealers across the nation. In the international market also it has established strategic relation with many reputed enterprises. The products have been exported to more than 15 countries for the last 15 years. Some of them are Nigeria, Kenya, Uganda, Ethiopia, Republic of Yemen, United Arab Emirates, Sri Lanka, Bangladesh, Sweden etc. The export of the company constitutes approximately 50 % of the total sales. The decades of dedication and perseverance has offered an elevated platform to the company to serve its customers by delivering the finest products in the industry. Today, Hitone Electronics offers the widest range of products in the industry. The products offer crystal clear sound, reliability and durability. All the products of the company are manufactured in-house. It possesses the expertise and cutting-edge technology to manufacture products in its own manufacturing facilities. It offers all the latest and most advanced products in the industry so that the customers enjoy the advantages. The company has scaled a phenomenal height due to its wide range of products that denotes quality and perfection. Hitone Electronics strives to continually improve its products. It has a progressive concept of continual improvement in quality, design and appearance of the products and that's why they are continuously accepted by the customers in the national and international markets. The products are thoroughly tested by sophisticated testing equipment before the final dispatch to the markets. Its brand name for the products HITONE BOSS is becoming more popular day by day in the industry.